Regardless of your position in the organization it is important for you to develop some sensitivity to non-verbal messages. Cooperation improves as we recognize and respond appropriately to non-verbal cues. Of course you have been aware of non-verbal communications all of your life, but how much thought have you given them? This guide will teach you everything you need to know about nonverbal communications. When Demosthenes was asked what was the first part of oratory he answered, "'action"; and which was the second, he replied, "action"; and which was third he still answered, "action." People tend to believe actions more than words! Have you ever heard anyone say, "His actions spoke so loudly I couldn't hear what he said?" Have you ever wondered whether anyone has said this about you? What we do is a means of communication, subject to interpretation by others. Did you ever stop to think that even failure to act is a way of communicating? Today, many researchers are concerned with the information sent by communication that is independent of and different from verbal information; namely, the non-verbal communication. 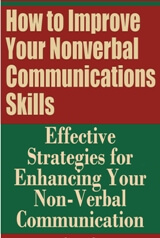 Verbal communication is organized by language; non-verbal communication is not. Communication is the transfer of information from one person to another. Most of us spend about 75 percent of our waking hours communicating our knowledge, thoughts, and ideas to others. However, most of us fail to realize that a great deal of our communication is of a non-verbal form as opposed to the oral and written forms. Non-verbal communication includes facial expressions, eye contact, tone of voice, body posture and motions, and positioning within groups. It may also include the way we wear our clothes or the silence we keep. In person-to-person communications our messages are sent on two levels simultaneously. If the nonverbal cues and the spoken message are incongruous, the flow of communication is hindered. Right or wrong, the receiver of the communication tends to base the intentions of the sender on the non- verbal cues he receives. Physical. This is the personal type of communication. It includes facial expressions, tone of voice, sense of touch, sense of smell, and body motions. Aesthetic. This is the type of communication that takes place through creative expressions: playing instrumental music, dancing, painting and sculpturing. Signs. This is the mechanical type of communication, which includes the use of signal flags, the 21-gun salute, horns, and sirens. Symbolic. This is the type of communication that makes use of religious, status, or ego-building symbols. Our concern here will be with what Porter has called the physical method of non-verbal communication. To function effectively as a team leader the manager must interact with the other members successfully. Non-verbal cues, when interpreted correctly, provide him with one means to do so. The team members project attitudes and feelings through non¬-verbal communication. Some personal needs such as approval, growth, achievement, and recognition may be met in effective teams. The extent to which these needs are met is closely related to how perceptive the team leader and team members are to non-verbal communication in themselves and in others on the team. Distance. The distance one stands from another frequently conveys a non-verbal message. In some cultures it is a sign of attraction, while in others it may reflect status or the intensity of the exchange. Orientation. People may present themselves in various ways: face-to-face, side-to-side, or even back-to-back. For example, cooperating people are likely to sit side-by-side while competitors frequently face one another. Posture. Obviously one can be lying down, seated, or standing. These are not the elements of posture that convey messages. Are we slouched or erect ? Are our legs crossed or our arms folded ? Such postures convey a degree of formality and the degree of relaxation in the communication exchange. Physical Contact. Shaking hands, touching, holding, embracing, pushing, or patting on the back all convey messages. They reflect an element of intimacy or a feeling of (or lack of) attraction.